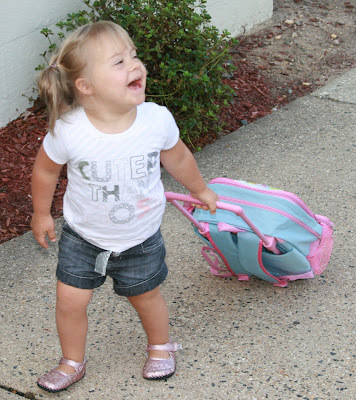 Today was Payton's first day of school. I had the day off, so Mason and I were able to drop her off and pick her up. Most other days she will be transported by her babysitter, who is a family friend. She did great when we got there ... pulled her little backpack into the school and put her stuff in her cubby, but when she realized Mason and I were leaving, she wasn't too happy. We worked through it though and we have been through these motions before when she attended a daycare facility. Thankfully that made it easy on me too. When we picked her up, she started crying as soon as she saw me. Despite that, they told me she had a great day! Aw, she looks so adorable! Such a big girl! Glad the day was a success! Oh how cute! Hope she loves school. BTW, love her shoes! Way to go, Payton! Such a big girl! Sammi had a similar experience, except the tears lasted a bit longer. Day 3 and she's getting better each day. I'll be avidly looking for updates on Payton's school experiences! She looks so proud of herself as she should be. Hope the year goes well for you both. I'm glad she had a good day at school. She looks sooo cute. You rock Payton and your shoes are awesome! What a big girl! She looks so cute!